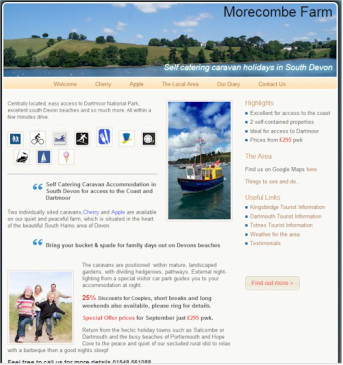 This Website is a simple user friendly website allowing you to view pictures and information about Morecombe Farm. If you would like to know more about Bookings or contact details, please click on the "Booking Website" tag or click on the "Booking Website" button above. This will take you to a different website "www.morecombefarm.co.uk/welcome" where you can book a caravan and contact the owners.